During 202/13 violinst Tom Bowes undertook a Bach Pilgrimmage, giving 50 concerts of Bach's unaccompanied sonatas and partitas and this Bach Pilgrimmage has become a growing feature of Bowes live performances since then. Arising out of the pilgrimmage is this recording on the Navona Records label of Bach's complete sonatas and partitas, recorded over a three year period. These are studio recordings, but the aim is to capture something of the live performances associated with them. Chamber music has always been a feature Tom Bowes musical life, he was the founding leader of the Maggini Quartet from 2003 to 2015, and has a duo partnership Double Exposure with his wife, composer and pianist Eleanor Alberga. In his booklet note Bowes talks about the personal background to the sonatas and partitas. Written in 1720 whilst Bach worked at the court of Cothen, the year was also the one where Bach's wife Maria died suddenly. 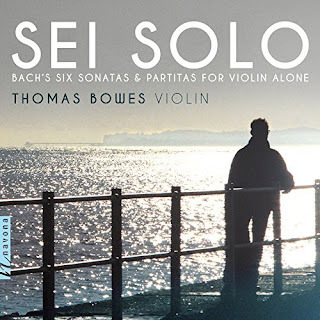 Bowes sees the violin works as a spiritual journey, informed by such moments as the opening Adagio of the C major sonata where the fugue subject is based on the Lutheran hymn Komm heilige Geist. 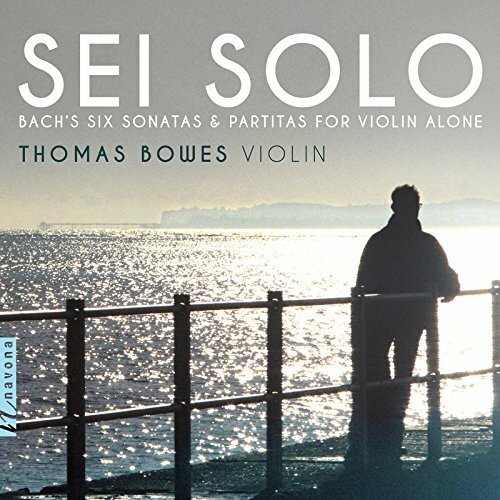 Bowes takes a sober and classically intense view of the sonatas and partitas, with speeds that are generally steady. Whilst he plays on a 1659 Nicolo Amati, it has a modern set-up and this is very much a performance informed by modern violin technique. We have no historical performing tradition for these works, and performers are very much able to discover the works for themselves. Bowes uses little historically informed performance, no fancy bow techniques and little if any ornament. What he gives us is a finely crafted and powerfully vibrant sense of line, elegant and expressive of tone. Whilst there is double stopping, chords and polyphonic passages, it is this sense of line flowing through the pieces which comes across most strongly. Bowes' rather sober approach is at its best in the more serious numbers, such as the opening Allemanda and closing Chaconne of Partita No. 2. The Chaconne in particular is a powerful and significant performance, bringing out the real emotional intensity of this large scale (in many ways) movement. The faster movement are hardly skittish, and are played with seriousness and gravity off set by some nicely crisp rhythms. Whilst the dance measures underlying Bach's music are present, this is hardly music to dance to. Bowes would probably argue that this was unsuitable given the emotional trajectory of the pieces. Recorded over three discs, this is a performance which views all six works as a whole and it is impressive the way Bowes keeps the architecture of this emotional journey in view all the time. Hearing him play the works in one go live must be a powerful and moving experience, but at home, I would always want other approaches too.